The ClearFox® Fixed Bed Reactor (FBR) is the most efficient and robust biological wastewater treatment process on the market. The ClearFox® Fixed Bed Reactor is a modification of the well know fixed bed process used globally. 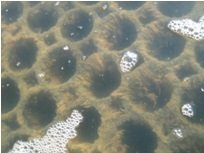 By utilizing special cascades and aeration sequences, the ClearFox® Fixed Bed Reactor can biologically treat municipal and industrial wastewaters. The ClearFox® Fixed Bed Reactor (FBR) technology has been independently verified by PIA GmbH – a leading notified test facility for wastewater treatment. The ClearFox® Fixed Bed Reactor (FBR) is a far more robust process than typical activated sludge processes. It also produces less sludge than conventional biological wastewater treatment processes. Also – due to the dens biomass on the fixed bed media designed by ClearFox®, the footprint of our fixed bed biological treatment units is much smaller than conventional systems. The ClearFox® Fixed Bed Reactor (FBR) does not require any chemicals for operation, and the ClearFox® Fixed Bed Reactor (FBR) is totally automatic in operation. The FBR reactor can be combined with other process steps such as the ClearFox® dissolved air flotation unit and ClearFox® clarifiers. The ClearFox fixed bed reactor is a robust, easily managed solution for complex applications. The biology in the fixed bed reactor regulates itself to a large extent and adjustments are made with simple control measures. This self regulation is only possible with submerged, permanently installed fixed growth media (fixed bed), where the nature and the amount of submerged sludge (dry matter content) is of lesser importance. This saves time, as with this reactor it, is no longer necessary to constantly measure the control parameters such as sludge content (via the dry substance measurement TS) to optimize the operation. In order to avoid having to oversize the sewage plants biological step, the waste water is buffered so as to absorb shock loads, thereby ensuring a continual uniform feed of waste water to the bioreactor. In the containerised version the Bioreactor is installed in a 20ft high cube sea-container with one door and has a 4.0 kw blower. It is insulated , reinforced for 2,5m water depth, has 2 x waterproof internal tanks, 3 cascades, 100/ 150 and 200m²/m³ biological surface, 3 openings with manhole access points, risers, fixed bed, aeration system and air splitter manifold. 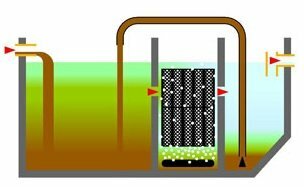 One container bioreactor can treat the wastewater of approximately 700 PE. Below ground modules are also available. The wastewater from the sewer enters the first tank (chamber) of the treatment plant for primary clarification. No primary settlement is needed if the weastewater is screened. Wastewater from kitchens in catering businesses is collected separately and fed through a fat separator or other technically suitable equipment (DAF flotation) to reduce the fats, oils and greases (FOG´s), before entering the primary treatment. A second container/tank follows for the remaining primary treatment and the required buffering, to absorb hydraulic fluctuations. In the containerised version, the primary clarification and buffer tank can be arranged as required, either placed one above the other or next to each other. 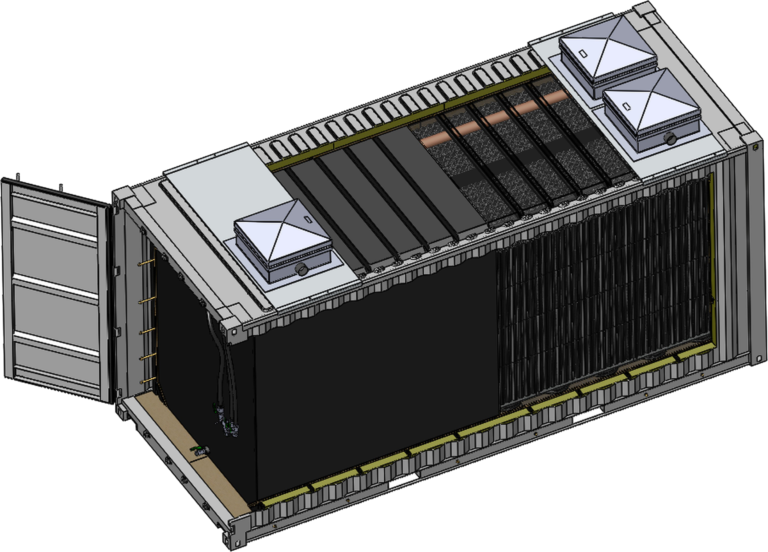 The sludge storage can be installed separately or integrated in the prechamber. A filling pump (pneumatic or electrical) evenly feeds the biology treatment stage (over a period of 24 hours). This ensures that in the event of subsequent load fluctuations the most favourable operating mode can always be set. For standard fixed-bed wastewater treatment plants, gravity pipes are used to fill standard treatment plants and there is no buffer pump. A biological layer (micro-organic colonisation) forms on the fixed-bed material after a start-up period. This transforms the organic contaminants contained in the wastewater into sedimentary and mineral substances. This is mainly the work of aerobic organisms. 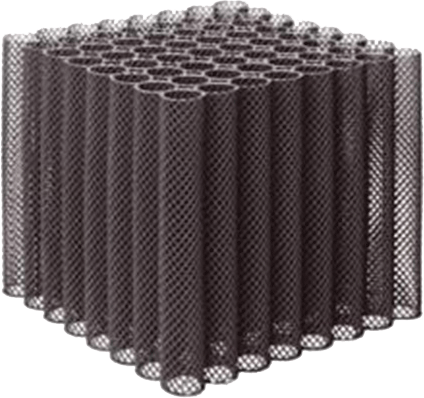 The aeration system installed underneath the fixed-bed material supplies the organisms with sufficient air. In addition, the rising air causes a current that, owing to the geometry of the fixed-bed material used, results in the contents of the tank being completely (horizontally and vertically) mixed (characteristic of an intermixed cylinder). How is the FBR connected? From the fixed bed reactor, the wastewater flows through gravity pipes to the secondary treatment tank, where secondary sludge and supernatant water are separated. The sludge return pipe can, as an option, be used for denitrification. The sludge that has built up can settle in the secondary treatment tank and is transported back to the sludge storage tank or prechamber using a submersible pump or an air-lift pump (secondary pump). The fixed-bed substrate is made up of UV-stabilised polyethylene which is non-porous, squeeze-resistant and will not biodegrade in the foreseeable future. 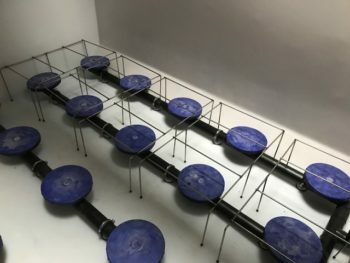 The fixed bed substrate has no toxic or chemical-physical effect on the biological cleaning process, is produced from net pipe blocks which are connected on the front ends. Due to its net-like structure, the material can be blended thoroughly. It has a specific surface (depending on the type of treatment plant) of 100-200 m2/ m3. It has no toxic or recognisable chemical or physical effects on the process of biodegradation. The fixed bed consists of stable individual tubelike elements that are arranged vertically and which are sideways permeable (tube network) and that are welded to one another at the head ends to form rectangular blocks. The meshed structure also allows the material to be intermixed horizontally.